Ever since the first smartphones were manufactured and gaming apps started being created and downloaded, there has long been talk of the death of console gaming because of the rise of mobile gaming. And at the beginning of this year, games industry market research company Newzoo predicted that mobile gaming would overtake console gaming for the first time in 2015. According to the Newzoo report, mobile gaming revenues are expected to increase worldwide, with a 51% rise expected in North America, and a 47% increase in Western Europe. However, the largest anticipated rise is forecast in South East Asia and China at an estimated 86% year-on-year growth. The indications from 2014 seem to back this theory up. 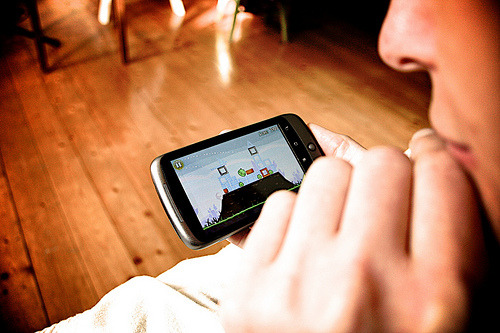 There was a 43% rise in mobile gaming when compared with 2013 figures. However, it’s unlikely that the growth of the mobile gaming industry will necessarily mean the death of other types of gaming. Today, most consumers have the option of four screens on which to do their gaming – the phone, tablet, PC and TV (console). And because of the variety of different places to play, the amount of time spent playing games has risen accordingly. There has been a 40% rise in time spent gaming in only two years. There are some games that are undoubtedly better suited to playing on a small screen than others. Certain casino games work really well on the small screen and as well as online casino websites now offering some of their games in mobile format, there are some providers that only offer mobile casino games. Fortune Frenzy is one example, where consumers can play a choice of slots, blackjack, roulette and bingo on their mobiles. They have the added bonus of receiving a free £5 of credit when they first register an account. And if they then decide to put some of their own money in, there’s another 100% bonus of which to take advantage. Gaming operators such as Fortune Frenzy clearly want to capitalise on the increased interest and demand for mobile gaming. This article on their blog makes a good point about the only possible downside of gaming on your mobile – making sure you have enough charge on your device! Of course, there will always be other games that are more suitable to being played on a larger screen and that’s why Newzoo has predicted a gradual evening out of spending across all four gaming platforms. Currently, spending on gaming is split as follows in the US: 44% on TV, 26% on PC, 15% on tablets and handheld consoles, and 15% on phones. Worldwide, the split is a little more evenly spread – with 28% on TV, 39% on PC, 13% on tablets or handhelds and 15% on phones. But, as it stands, mobile gaming is certainly where it’s at in terms of growth markets. With mobile gaming revenues anticipated to reach $30.3 billion by the end of 2015, it’s clear that online casino operators are doing their best to grab their share of this burgeoning market.